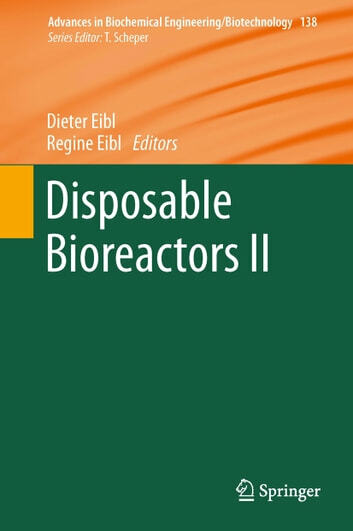 Dynamic Single-Use Bioreactors Used in Modern Liter- and m3- Scale Biotechnological Processes: Engineering Characteristics and Scaling Up, by Christian Löffelholz, Stephan C. Kaiser, Matthias Kraume, Regine Eibl , Dieter Eibl. Orbitally Shaken Single-Use Bioreactors, by Wolf Klöckner, Sylvia Diederichs, Jochen Büchs. Therapeutic Human Cells: Manufacture for Cell Therapy/Regenerative Medicine by Christian van den Bos, Robert Keefe, Carmen Schirmaier, Michael McCaman. Fast Single-Use VLP Vaccine Productions Based on Insect Cells and the Baculovirus Expression Vector System: Influenza as Case Study by Regine Eibl, Nina Steiger, Sabine Wellnitz, Tiago Vicente, Corinne John, Dieter Eibl. Microbial High Cell Density Fermentations in a Stirred Single-Use Bioreactor by Thomas Dreher, Bart Walcarius, Ute Husemann, Franziska Klingenberg, Christian Zahnow, Thorsten Adams, Davy de Wilde, Peter Casteels, Gerhard Greller. Quorus Bioreactor: A New Perfusion-Based Technology for Microbial Cultivation by Sheena J. Fraser, Christian Endres. Cultivation of Marine Microorganisms in Single-Use Systems by Friederike Hillig, Maciej Pilarek, Stefan Junne, Peter Neubauer. Flexible Biomanufacturing Processes that Address the Needs of the Future by Bernhard Diel, Christian Manzke, Thorsten Peuker. An Approach to Quality and Security of Supply for Single-Use Bioreactors by Magali Barbaroux, Susanne Gerighausen, Heiko Hackel. 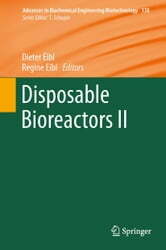 A Risk Analysis for Production Processes with Disposable Bioreactors by Tobias Merseburger, Ina Pahl, Daniel Müller, Markus Tanner.